Website builders are on the rise these days. They boast the capability of helping anyone build a nice-looking website, with no technical experience at all. What’s more, website builders are inexpensive, comparing to hiring a web professional. Many site builders are freemium services, which means you can create a free site and enjoy your free account as long as you need, without having to upgrade it. While this may sound like a great option for those who want to set up a site just for fun, the whole idea of using a free version of a site builder for a business website is ridiculous – 99% of free websites are ad-supported and are published to a subdomain, for instance yoursite.weebly[dot]com. To get rid of the ads and to connect a custom domain, you need to upgrade your account. A paid account will cost you around $3-$20/mo, depending on factors like whether or not you need eCommerce capabilities, priority support, personalized emails and other add-ons. Wix – is the cheapest website builder, which lets you create different types of websites of any complexity. The platform is one of the most affordable in the contemporary web design niche, offering extensive feature set that can come up to your needs. • Free App Market – Yes. The website builder has won worldwide recognition due to its advanced Wix ADI tool, which creates decent websites in the automated mode by using the content you’ll provide. The service is also known for its functional App Market with plenty of free and paid integrable widgets. If you have a desire, you can make use of the advanced Wix Code App Builder to create your own applications. To enhance your website performance, you can also try extensive Wix blogging features. Wix has a free plan, which never expires and allows testing the system features to the advantage. As to the premium subscriptions, there are five of them here. The cost of the cheapest Connect Domain plan constitutes $4.50 per month only. The plan allows connecting your own domain name and creating the required website type. However, it also implies the use of the ad banner at the home page. If you wish to get rid of it, though, then it makes sense to upgrade to the Combo Plan, which will cost you $8.50 per month (free domain name included). uKit – is one of the cheapest small business website builders. Working with the system’s editor is absolutely simple: the builder is dominated by a preview of your website so that you can immediately see all your edits in action. The service also offers a set of integrable widgets that can boost your website performance. • Free SSL – Yes. uKit offers a very simple pricing formula: the full feature set costs $5/mo, and it is discounted to $4/mo if you choose annual billing. With SWB-25 promo code, the cost of the monthly subscription will become even more affordable – $3.5 only. The price includes hosting. 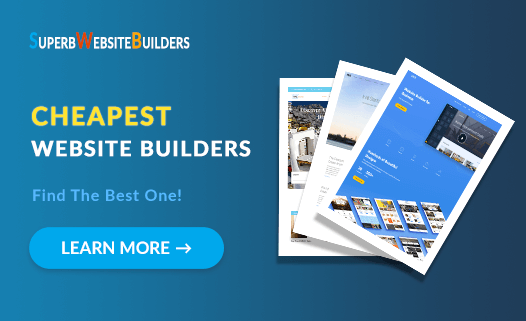 This is the cheapest business website builder you can come across in the modern web building industry. IM Creator – is one of the cheapest website builders for creatives, who can use the service absolutely at no cost at all. There is no need to master complex coding nuances here – building websites with IM Creator is stunningly simple and intuitive due to the application of the Stripes and Polydoms technology the system uses. The platform offers a collection of responsive customizable templates, user-friendly interface, multiple web design features, HTML integration options, SEO parameters etc. The service works well for creating different types of websites, including portfolios, landing pages, business websites etc. IM Creator is a free system, but only for non-commercial organizations, artists and students. The cheapest plan for entrepreneurs, which includes domain connection option, costs $8 per month. Ucraft – is a cloud website builder, which makes it possible to launch a multilingual website at reasonable prices. Mastering the platform is easy and quick for beginners and web design professionals as it comes with intuitive dashboard and convenient web creation process. With Ucraft, you can launch outstanding portfolios, business websites and landing pages. Among the features that make the system suitable for these purposes, it makes sense to mention responsive template collection, Logo Maker, Landing Page Builder, Designer Tools, Articles App, eCommerce feature, multilingual support, extensive integration features etc. The cheapest Ucraft subscription – Landing Page Plan – is absolutely free. It comes with a custom domain name and free integrated hosting. The cost of the Basic Plan constitutes $6/mo, which unveils more opportunities for the development of full-featured websites. WordPress – is one of the cheapest Content Management System. Its application sphere initially came down to blog design. As the service kept developing, it gained popularity with users as all-in-one solution for the creation of different types of projects, including portfolios, business websites, landing pages, online stores etc. • Visual editor – Yes. WordPress functionality and popularity is explained by its abundant integration options. To get the most out of your web building process, you won’t go without integrating plugins and templates, which are specifically designed to come up to various niches. This task, however, may be a challenge for inexperienced users, who have never been involved into website development before. The CMS is free, but you should be ready to invest into plugins, themes, domain and hosting. The final cost depends upon the plans of the hosting provider. Thus, the cheapest SiteGround plan – StartUp – will cost you $3.95 per month. It is enough to connect a domain name, create one full-featured website and get a broad range of essential features the hosting offers. Today, you don’t need a truckload of money to build a decent website. Code-free website builders make the process of website creation as easy as it gets for only $3-$7 a month without any setup fees. For that price, you will get a website template, secure hosting, the site building software itself and professional support. Wix is a cheap and the most convenient all-in-one website builder. It covers a broad spectrum of web design features and offers several plans to come up to versatile web building needs. uKit is rightfully considered one of the most affordable website builders, which additionally offers powerful functionality and impressive flexibility. The system works well for the development of small business websites and other project types. IM Creator is a cloud website builder, which is free for users, who don’t intend to make profit with it yet need to get a quality project. For other user categories, the system offers affordable subscriptions to cover a wide array of web design needs. Ucraft is a drag-and-drop website builder, which deserves the attention due to its advanced web design features. You can use the system to launch portfolios, landing pages, business projects etc. WordPress is a renowned CMS, which is free for all user categories and makes it possible to launch projects for personal and business use. To enhance the efficacy of the web building process, you’ll need to invest into plugins, templates and hosting. Please note that we are talking about simple informational websites consisting of approximately 10 to 25 pages with some basic content management tools and widgets. Some of the above platforms also include eCommerce functionality in their starter plans, but limit the number of products you can sell. How much did it cost you to build your site?